I know I have been a slack blogger in recent months but I have to interupt my sloth to tell you about two very exciting things, both coming up later this week at Festival of Quilts. First, there is the Buy a Plank Challenge. 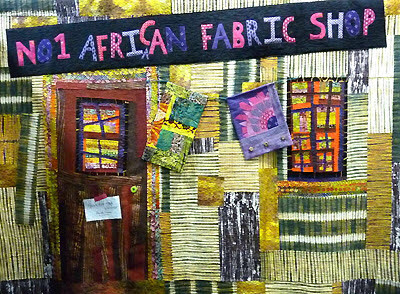 Anyone who went to the Uttoxeter show in April may recall the almost lifesized No I African Fabric Shop Shack I made in tribute to my good friend Magie Relph and of course Alexander McCall Smith, author of the referenced No 1 Ladies Detective Agency novels. It was fun to make and to get Magie's reaction, but what do you do with a 90 x 80 inch wallhanging? Cut it up into pieces! Yes, really! You can read all about it here. 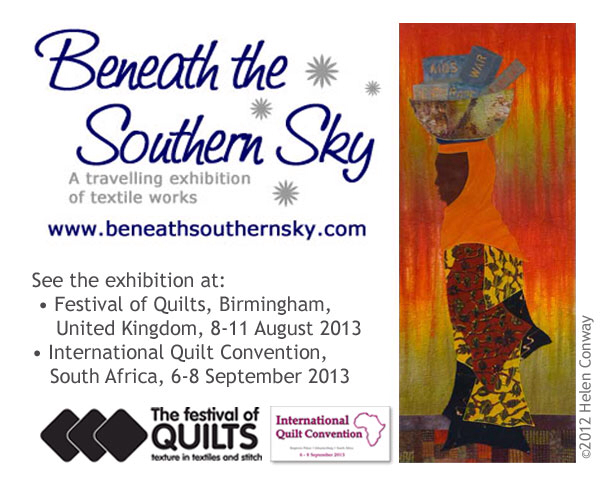 Basically after Festival the quilt will be cut into a limited edition set of planks ( each having a variety of fabrics) and the buyer will commit to turning their plank into another art work which is then guaranteed a place in a special exhibition at Uttoxeter next year. Hopefully many new art works will be made available for auction. Proceeds from planks and art works go to aid a clinic where one of Magie's fabric dyers volunteers. Buy your plank here before they sell out!! I am confident this gallery will be one of the highlights of the show, so don't miss it! Looking forward to seeing the gallery. I am looking forward to that exhibit!